Room 17 students are using Augmented Reality to review their knowledge and understanding of plants and the life cycle. We are using it through the app Metaverse! Look how engaged they all are!!! They love it! Have you ever wanted to create a house out of cardboard? As Room 41 explored the difficulties and accomplishments of construction, a whole new way of discovery built up. Different designs filled the room and judges (Mrs. Gawel, Mrs. Castleman, Dr. Winslow, Mr. Kramer, Ms. Manari) with excitement. When everyone presented their houses, the judges showed the wonderful scores and declared the winner. Though everyone got great advice, there was only true triumph. This was a wonderful experience for all to enjoy! Third grade students got to experience 'Ssuuna', a musical performer from the 'Young Audiences Arts for Learning'. His energetic performance had students and teachers out of their seats, singing, dancing, and interacting with musical instruments from his native country of Uganda. We extend much appreciation to our PTO organization who brought this learning experience to our students. How can an elephant sit on an egg? Anything is possible in a Dr. Seuss book…or in a STEM lesson. Students all over Hershey Elementary celebrated 'Read Across America Week' and Dr. Seuss last week. 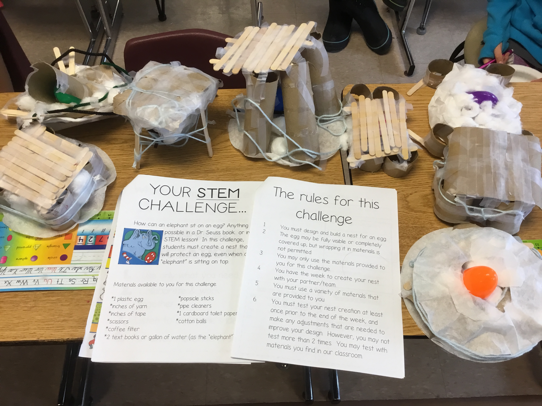 In this particular challenge, third grade students created a nest that will protect an egg, even when an “elephant” is sitting on top. Second Grade students took the Rube Goldberg Challenge. Each group was given three pieces of track, a marble, a golf ball, a tennis ball and a car. Their goal was to build an incline that would allow each of these objects to roll down the track and into the box. If completed, the track would be extended to see how they would have to change their design to reach the box again. Last week many classrooms at the elementary building participated in a classroom Valentines exchanges. 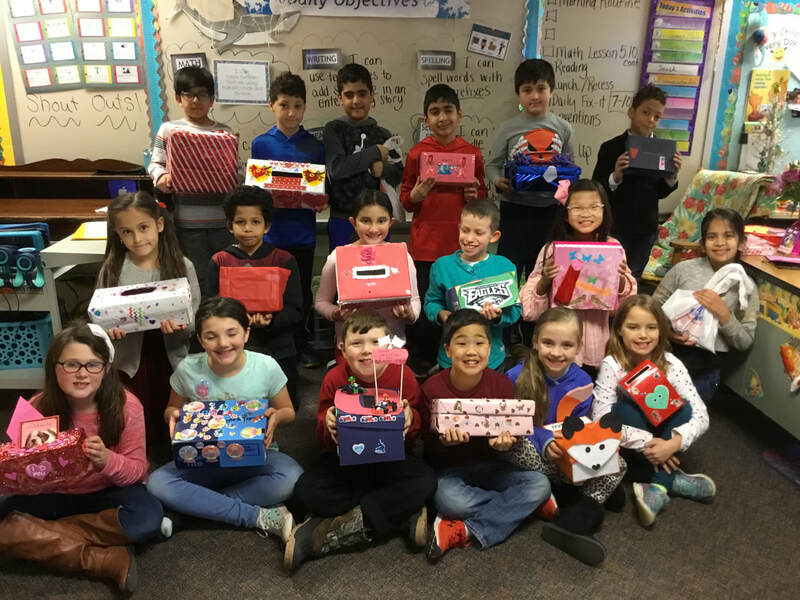 Room 18 Students, in 3rd grade, used their creativity to design valentine mailboxes and bring them to school to collect all of their goodies. We had a lot of fun celebrating this special day and spreading kindness. Second grade students in Mr. Paukovitch's class explored and practiced math while perfecting their basketball skills. Students took turns throwing foul shots at different distances, then recorded data for the number of baskets made. After working together to add and subtract the data, they discussed the probability of making baskets from different distances. The students showed excitement while they supported each other in making baskets and applying their math skills! First Graders from Miss Helsel’s Room came to visit Mrs. Sachs’ Kindergarteners and played with “Loose Parts”. Loose Parts are ordinary objects that the children use to construct a variety of creations with daily! This develops their creative thinking and allows every child to play with something that interests him/her! The First Graders had fun and are excited to incorporate this play into their day! Third grade mathematicians are really getting into their work as they learn about perimeter and area as they build rectangles to scale. 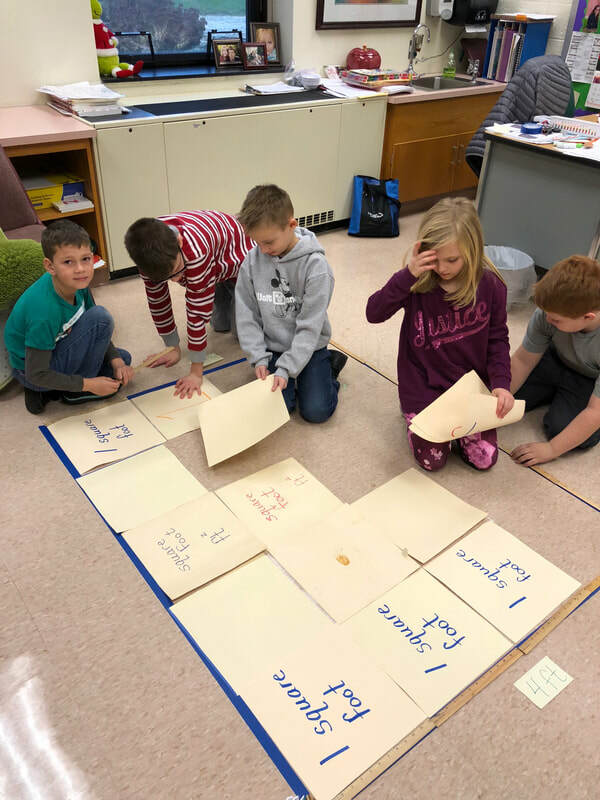 Students in Mrs. Snyder’s math class are developing an understanding of how area and perimeter are related and how to determine each measurement. 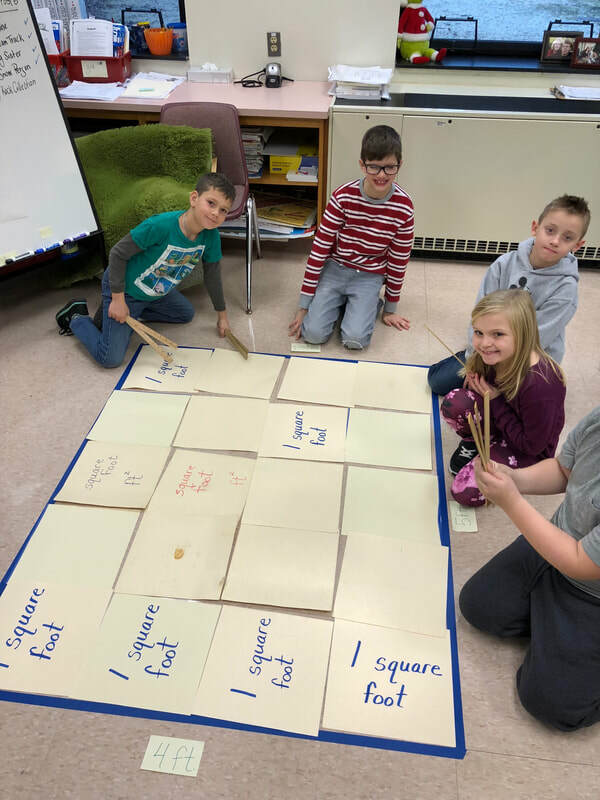 The square foot tiles on the floor are a perfect place to model the math concepts!